Time for CPE to broaden its horizons? Now that the county council has taken over the regulation of on street parking, law and order has been restored to our town centre, with shoppers and visitors finding it easier to stop to make a quick visit to a local shop or office. The Civil Parking Enforcement (CPE) officers now know where the hot spots are and are able to target these to great effect. One might even suggest that few of these offences take place before 8.45, or between 2.30 and 3 pm on any given day. Given their effectiveness at restoring order to the ‘wild west’ that was Spalding town centre, I wonder if the powers that be would consider widening the remit of CPE in order to restore some order to the streets around our schools? As any highway’s officer or traffic cop will tell you, Spalding isn’t unique when it comes to stories of bad behaviour by car driving parents on streets around our local schools. Until now, the police have been the only ones with the powers to deal with these miscreants. Given the lack of police resources, the likelihood of a cry of, ‘you’re nicked!’, being heard outside of any school gate, is virtually nil. However, with the advent of CPE, we now have the potential to address this problem, thereby reducing the misery suffered by residents living in the streets surrounding our schools. Most of our schools now have yellow zigzag lines on the road outside their front entrance. Whilst this seems to do the job of keeping these areas clear at the required times, it also has the knock on effect of pushing bad parking behaviour into surrounding streets. I’m not suggesting that we should now be scarring every side street, around every school, with double yellow lines – as well as being an eyesore, that would make life even more difficult for residents. However, I do believe that it should be possible to make effective use of CPE to enforce some of the existing rules on the parking of vehicles on the public highway. Parking across a driveway where there’s a dropped kerb is an offence, as is parking with 10mts of a junction in most instances. Once a few tickets have been issued outside of a number of schools and over a period of time, word will soon get around that the parking enforcers have widened their horizons and that it’s time for car driving parents to start behaving themselves. Here’s an interesting article that I lifted from an online feed. – thanks go to, LocalGov.co.uk and Nick Appleyard. It makes the point local councillors have been making ever since the days when Labour’s John Prescott and his Office (ODPM) interfered with the planning system. The Office of the Deputy Prime Minister and Prescott (now both long gone, thankfully) decided you could reduce use of the private car simply by reducing the space people had to park them outside their homes. Playing straight into the hands of those developers who never miss a chance to squeeze more and more into less and less, we now now have whole swathes of housing development with inadequate parking provision, leading to exactly the problems highlighted in this article. Poor council parking policies can lead to an increase in crime, dangers to pedestrians and poor public health, experts claimed today. The stark warning came in a report from the Institute of Highway Engineers (IHE) and the chartered Institute of Highways and Transportation (CIHT). The Government removed national limits on residential parking as part of its ‘end to the war ing son the motorist’ in January 2011. 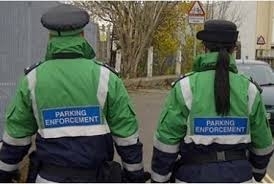 But local authorities are still required to set their own parking standards and the two organisations have issued fresh guidance to ensure the right decisions are made which will benefit communities. 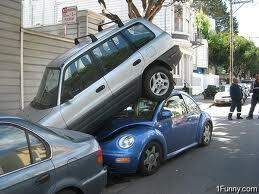 The guidance said allocating parking to individual homes increases the amount of space needed and suggested more flexible approaches increase overall use of space. It also claimed car parks ‘tucked away’ behind developments are prone to vandalism and crime and are therefore underused leading to ‘serious’ on-street parking problems. The guidance said strict enforcement of on-street parking makes garage parking more likely, but stressed garage doors need to be high and wide enough for modern vehicles. ‘Parking problems manifest themselves in pavement parking, blocked driveways, difficult access for delivery vehicles and refuse collectors, damage to verges, trees and footpaths, and cluttered, unsightly streets,’ the organisations said. ‘The Government has concluded that national constraint policies have led to ‘significant levels of on-street parking causing congestion and danger to pedestrians’. In preparing new policies, local authorities are being urged to make the right decisions for the benefit of their communities. Up to now I, along with my fellow ward councillor, have attempted to be as helpful as possible in respect of the county council’s attempts to increase primary education provision in Spalding. A s106 that gave LCC 1.5 hectares of land and £1.3m towards the provision of a brand new school, was due to terminate in 2013, meaning that the county would of been left with no means of increasing the education provision, other than by raiding its own rapidly diminishing coffers. Loss of these funds and the associated land would leave the county council with an ever increasing number of children to accommodate, but no money to do it with – hence our very qualifed support. The county council have moved very quickly from the provision of a new school on the s106 land, to using the associated money to expand Spalding Primary School. The school already suffers from significant issues regarding traffic congestion and parking. My attempts to offer a radical solution to both the existing and the inevitable future parking and traffic problems have apparently not found favour with the county council. Also, having now seen the architect’s plans for the so called extension, my support for this plan is melting away faster than the latest fall of snow. Not only has the extension become a totally separate building, of virtually equal size to the main body of the existing school, the traffic and parking solutions being suggested are, in my opinion, nothing of the sort and will not offer any relief from the daily misery visited on residents. Unfortunately, the county council is able to give itself planning permission for such schemes and given their remote and too often high-handed attitude to local issues, I am fearful that the residents concerns will be over-shadowed by ‘the greater needed’, or worse still, ‘the bigger picture’. Lincolnshire County Council education department have gotten themselves in to this mess by failing to forward plan and build on the opportunity presented by having a large area of land available and a £1.3m pot of money. Had they started budgetting from the moment the planning application was approved, I am sure they would of had a significant pot of money to add to the index linked sum now about to become available to them. Instead, they have chosen to use only the s106 money to squeeze what is effectively a 210 place infant’s school, on to the same site as an already full to capacity junior school. in an urban location, where many of the children would be taken to and from school by either public transport, or Shanks’s Pony, this type of over-development might be acceptable, because whilst the school might be very busy, the roads and streets around it would be little affected by the comings and goings of parents and children. 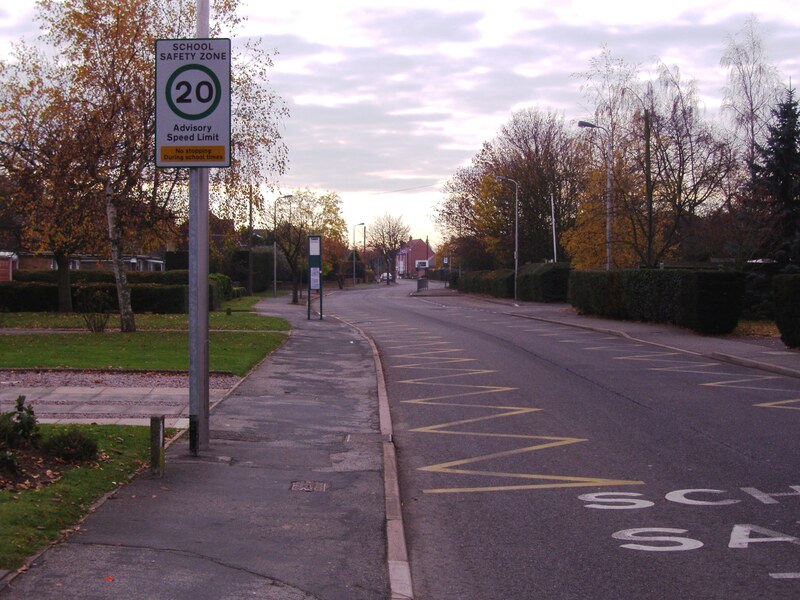 Unfortunately for LCC, this situation does not apply at Spalding Primary School and a large number of children are transported there by private car, all of which must find space to manoeuvre and park in the streets around the school. The combination of an enlarged school and inadequate traffic and parking solutions, means that residents will very likely have to endure even greater problems should these plans go ahead. We have organised a public meeting at the school on 5th March at 7pm, so that the public can come along, hear more about the plans and most importantly have their say. How disappointing it was to see the Spalding Post Office once again under threat of extinction, following a commercial decision by person or persons unknown. When the current location, within the Co-op centre in Winsover Road was first proposed, I made my reservation clear, particularly with regards to its location within the bowels of the building. When the proposals were first made public, I asked what would happen if the Co-op decided to move on and what guarantee would there be that any new owners would want to continue to run a Post Office slap bang in the middle of their retail operations? As it happens, I have been proven right, with the new owners wishing to evict the Post Office operation. Also, not only was it a far from obvious location, sandwiched between the food and furniture departments, it was also one of the most uninviting and depressing places I had ever seen a shop located in. It was bad enough just being a customer waiting in line and staring at the blank magnolia walls, what it was like to work in that windowless tube day in day out, one can only imagine. A plea to the management to put up some posters and place the odd artificial potted plant fell on deaf ears, like most communications with Post Office management. The loss of the experienced, dedicated and well liked staff of the original Sheep Market Post Office was immediately noticeable, as was the apparent under-staffing, as queues regularly formed well beyond the opening – entrance is too grander term. We are now told that the Post Office is to move next door to No 7A Winsover Road, a modest shop front previously home to an insurance broker. We are also told that the nearest car park is only 50 yards away. What they don’t mention is, that this is the old the car park, but is now around the back of the building and without direct access. Given Spalding’s current lack of any meaningful parking enforcement, I imagine it won’t be long before we see traffic backed up due to drivers pulling up in front of 7A in order to just ‘nip in’ to post a parcel. As I said, the shop front is modest and it is difficult to judge exactly how much space will be available to customers. However, I’ve a strong suspicion that at busy times, queues could well be out of the door and on to the street. On the plus side, the place will now have some natural light from the shop frontage, so the staff should find it a much more pleasant place to work. I just hope the rest of us find more pluses than minuses come from this latest move of our Post Office.